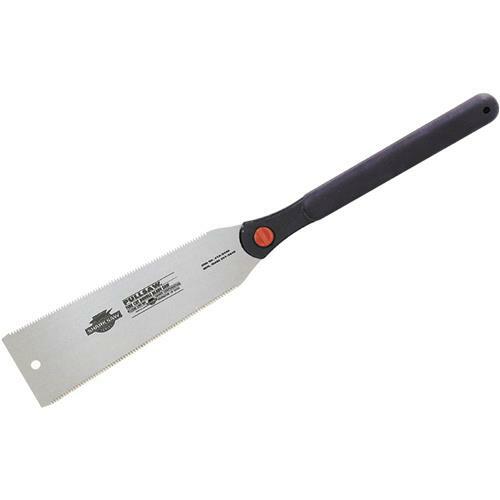 Super Finecut Double Saw 8-1/2"
Shark 10-2450 - Super Finecut Double Saw 8-1/2"
A traditional Japanese double saw, designed for fine finish work. The rip teeth are 9 tpi (teeth per inch) for fast and efficient cutting with the wood grain, while the cross cut teeth are set at a super-fine 24 tpi for the finest, smoothest cuts. This is an excellent jamb saw for flush cutting of molding and trim. It's also ideal for general finish work. This saw works much like its sibling, the 10-2440 FineCut Double Saw (in fact, its Recommended Uses overlap). With its thinner blade and greater number of teeth, it's better suited for precision jobs. No wonder it's the saw of choice of fine woodworkers everywhere. Recommended For: All sizes of plywood, particle board and melamine. All types of wood siding; staircase construction; accurate cuts of all angles. Great for trimming a thin strip from the bottom of a door to accommodate thick carpeting - without removing the door from its hinges. Cuts through flat foam sheets; moldings of all sizes and widths at all angles. Interchangeable with: 01-2440 FineCut Double saw blade, 01-2310 Long Reach saw blade. Precision ground blades for accuracy and a traditional Japanese design for exceptionally straight cuts, even overhead. Many professionals use these blades for cuts where precision outweighs speed. Great for finish work. 23TPI on one side, 18TPI on the other.